Beneath the Sea has always been proud to have been a part of the founding of the Women Divers Hall ofFame (WDHOF). Never have we been more proud than we are today as WDHOF begins to celebrate the start of their twentieth anniversary. This weekend Beneath the Sea wants to recognize and honor this unique, active, professional honor society which has used the myriad talents of its inducted members to forge a true sisterhood focused on a culture of education and service across these past twenty years. WDHOF recognizes women divers for their contributions to the exploration of the underwater world, art, science, and service to the global diving community. For WDHOF an important part of this mission is offering scholarships, training grants, and a mentorship program of opportunities found throughout their worldwide network of dive industry contacts. 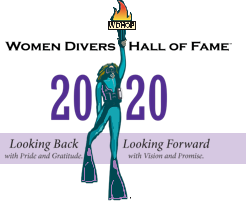 Twenty years later the WDHOF membership has grown from an inaugural class of 72 to a membership today of 238 exceptional women representing successful careers from all are as of the diving community. The WDHOF scholarship and training grants program, which supports the next generation of diving leaders, scientists, explorers, educators and photographers, has grown from an initial 3 scholarships in 2002 to 27 distinct scholarships this year. In 2019 WDHOF will be supporting 59 women and men with awards totaling over $79,000. We recognize this organization for its dedication and commitment, and the collaborative efforts of so many of the Sea Sisters in accomplishing these goals. Today WDHOF is recognized throughout the world of diving asan imaginative and talented group of women leading and inspiring others, young and old, throughout the world into lives dedicated to the oceans, its environment, its conservation, science and art. For all these attributes and for the dynamic society of diving women they assemble wherever they go, Beneath the Sea selected WDHOF as this year’s Legend of the Sea, for their work is legend and their name will resound throughout the history of diving. We also acknowledge and sincerely thank the Founders of WDHOF: Armand Zigahn (Beneath the Sea), Hillary Viders, Ph.D., Carol Rose (The Underwater Society of America), Captain Kathy Weydig, Jennifer King (Women’s Scuba Association), and Patty Mortara (Women Underwater). Recognizing the gathering strength of women in the global diving community, the Founders chose wisely and well when they built the foundation of the WDHOF. From those roots emerged the leadership and energy, focus and talent which has propelled and raised the Women Divers Hall of Fame into its orbit today.